Who doesn’t like spring, it’s the time where nature shifts from gray to color. I liked both the last autumn and the winter, because some things are beautiful in this season as well, but now I am really ready for the spring and summer. I shot the photo above 3 days ago, the spring flowers starting to grow, I like that. I always enjoy seeing the first spring flowers pop up but at this time of year I’m thinking about planting new bulbs. The summer has been so dry that I have deep cracks in the earth in the flower bed where I’ve had daffodils for several years. I can see the bulbs and I’m afraid the hot weather may have done them harm so maybe it’s time to dig them out and start over. That’s sad Vanda, but on the other side, it might be interesting to plant new ones and see them grow. We have a different problem here of course, some pretty cold days followed after I shot the photo, so it’ll be interesting to see if the flowers can take that. Anyway, overall, our winter was rather moderate, at least for Northern German circumstance, and we assume to get lots of insects this summer, because that’s usually the case when the winter has not been extremely cold. 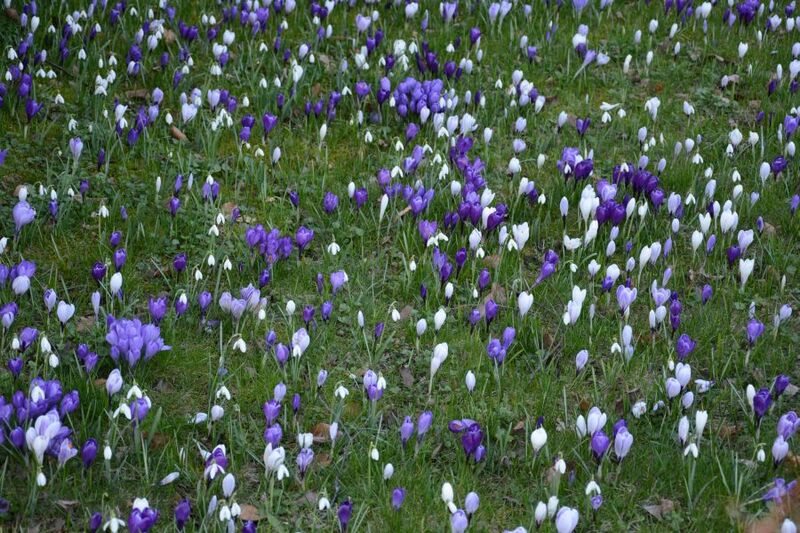 What a profusion of crocus! Here, we are expecting snow overnight. We have still very mixed weather at the moment, there have been some warm spring days, but now it’s colder again and rainy, like autumn.